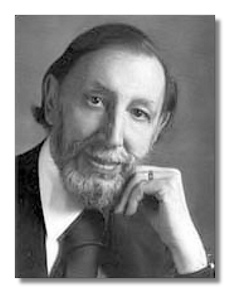 Alan Hovhaness (also spelt Hovaness) was an American composer of Armenian and Scottish descent; and perhaps the most distinctive figure in contemporary music… also one of the most prolific, with an opus tally hovering around 400. Chronologically, part of the generation of composers who followed pioneers such as Henry Cowell, George Gershwin, Virgil Thomson, Carl Ruggles, Aaron Copland and the rediscovery of Charles Ives (therefore roughly contemporaneous with William Schuman, David Diamond, Lukas Foss, Leonard Bernstein, etc); but stylistically a maverick, whose music reflects a love of Western counterpoint and a personal fascination with by Indian, East Asian and Armenian music more obviously than any contemporary musical thought. Hovhaness is said to have begun composing aged four; then studied with Frederick Converse at New England Conservatory and with Bohuslav Martinů at Tanglewood. Despite an early interest in Indian music, his compositions prior to the Second World War tend to suggest a mixture of Baroque structures and late Romantic (particularly Sibelian) melody. The early "Exile" symphony (Symphony No. 1; 1939) and the String Quartet No. 1 "Jupiter" (1936) – which includes the original version of his "Prelude and Quadruple Fugue" – are surviving examples (see below) of this early period of composition. Rethought his approach to composition while working (as composer, organist and teacher) in Boston (1940-1952); partly in response to criticism of his work by Copland and others at Tanglewood. The input of the mystic painter Hermon DiGiovanno (after whose work the "Celestial Gate" symphony (Symphony No. 6; 1959) was written) also became significant at this time. It should also be noted that much of Hovhaness's music during this period was written with a specific student ensemble in mind… like the Baroque composers Hovhaness admires, he found inspiration in the technique of writing for the musicians to hand. Hovhaness's mature style was first revealed in a work for piano and string orchestra entitled "Lousadzak" ("Dawn of Light"; 1944); which introduced Hovhaness's quasi-aleatoric Senza Misura technique (often called "Spirit Murmur") to a wider audience. In this technique, individual sections of the orchestra are instructed to continuously repeat a cycle of melody without temporal reference to other members of the ensemble. Most obviously, this technique (one of the most common components of the "Hovhaness style"), creates a gorgeous sense of rhythmic mystery from which (in "Lousadzak") the solo piano slowly emerges… at other times, the technique clearly foreshadows the work not just of modern minimalists such as Terry Riley and John Adams but also the entire Ambient/New Age school of composition (indeed, Hovhaness later recorded a disc of his own piano music – "Shalimar" (see below) – for a "New Age" label). During this period, Hovhaness also lit the first of his legendary carthartic bonfires; and destroyed a large number of early works. While this gesture certainly reflected the depth of his stylistic rethinking, it's also true that the scale and terminality of these bonfires have grown with each retelling… at least one reference claims that more than a thousand works were destroyed in this particular flame. Hovhaness was also able to recycle supposedly destroyed works in later compositions: the Allegretto Grazioso third movement in his "City of Light" symphony (Symphony No. 22; 1970) originally derives from an operetta written and performed in 1920s. Through the subsequent half-century, Hovhaness has tended to refine rather than fundamendally change his basic musical approach. This doesn't mean his music has been stylistically static (the New Grove has subdivided Hovhaness's musical career into five distinct periods)… rather, that underlining the differences in his musical texture has been a clear and uniform "voice". Extensive travel throughout India and Asia casts an obvious shadow over much of his music from the fifties and sixties, coloring but not disguising the composer's distinctive palette ("Korean Kayageum" (Symphony No. 16; 1962) was written for Korean percussion and strings); while the works of his "retirement" (from the early seventies onwards) have tended to return more to Western models… still, the composer of the early "Exile" symphony remains recognisably the same composer of the "Mount St Helens" symphony (Symphony No. 50; 1982). The basic characteristics of the "Hovhaness sound" are easier to recognise than define; but one of the most obvious "markers" is the strong mystic/religious "feel" to all his works. Another is Hovhaness's distinctly "vocal" style (rather like Chopin, oddly) – even his orchestral work tends to sound as if it's being "sung"… an effect accentuated by Hovhaness's regular use of exposed solo lines over transparent string continuo (to use only the most obvious example, "The Prayer of St Gregory" for trumpet and strings from the opera "Etchmiadzin"; 1946). Again like Chopin, Hovhaness is primarily a minaturist – the longest "through-composed" work of his presently available on disc would be the "Majnun" symphony (Symphony No. 24; 1973), which in Hovhaness's own recording (see below) runs 48 minutes; but even this consists of nine distinct movements played with pause (the "St Vartan" symphony (Symphony No. 9; 1950) consists of no less than 24 sections). Hovhaness's music uses consonant harmonies, organised modally or chromatically rather than tonally; and balances out the rhythmless sound of Senza Misura ("Spirit Murumur"; see above) with an almost riotous love of counterpoint. His music is generally and deliberately easy to play; although the exposed solo lines in works such as "The Prayer of St. Gregory" can be subtly terrifying for the soloist. Throughout his career, Hovhaness has continued to find musical inspiration in the practical challenges of "gebrauchsmusik"… most famously, perhaps, in the "Symphony for Metal Orchestra" (Symphony No. 17; 1963), which was commissioned for – and premiered at – a Cleveland metallurgical convention (the symphony was therefore scored for the unique ensemble of six flutes, three trombones and metallic percussion). One of Hovhaness's most famous works – "And God Created Great Whales" for prerecorded whalesongs and orchestra (1970) – may also fit into this category; having been commissioned by André Kostelanetz (a regular patron of Hovhaness's music) to "fit around" a set of pre-existing tapes of whalesongs.